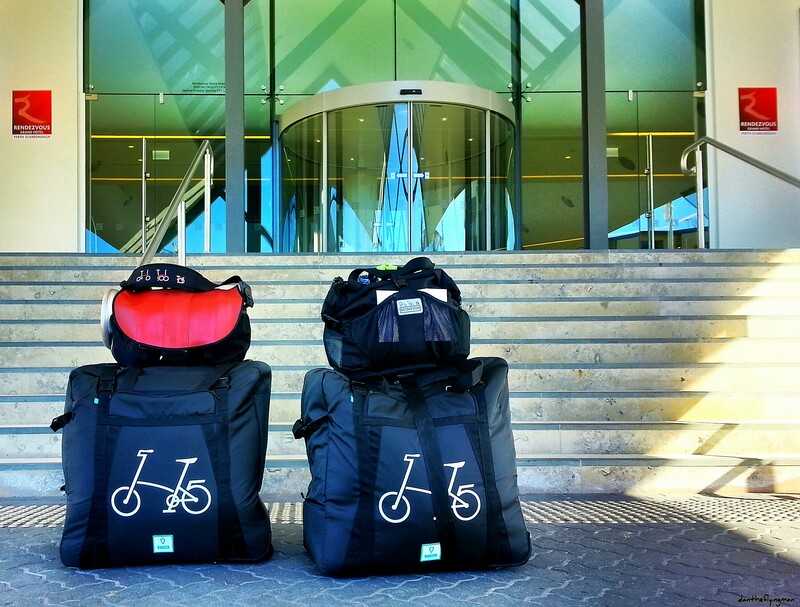 We headed off to Perth in the first week of June to explore the place on our Bromptons. 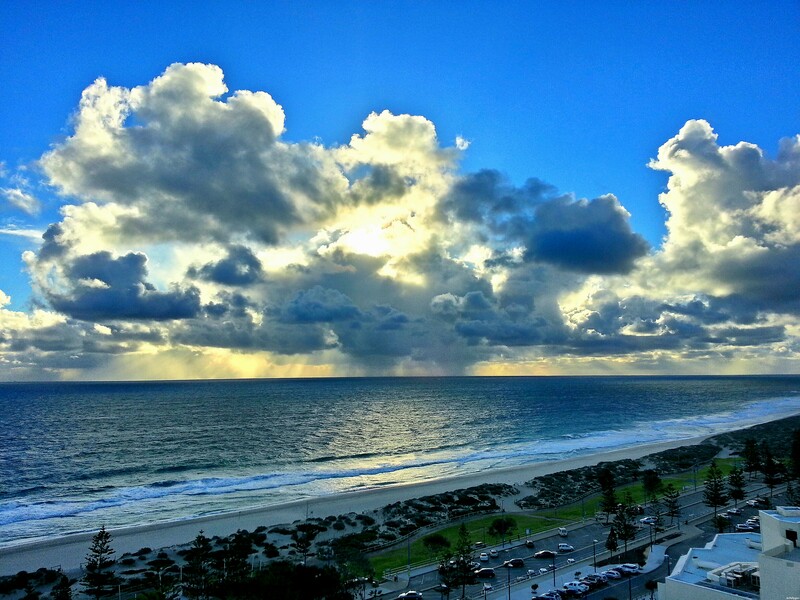 This would be Missus’ first visit to Perth. 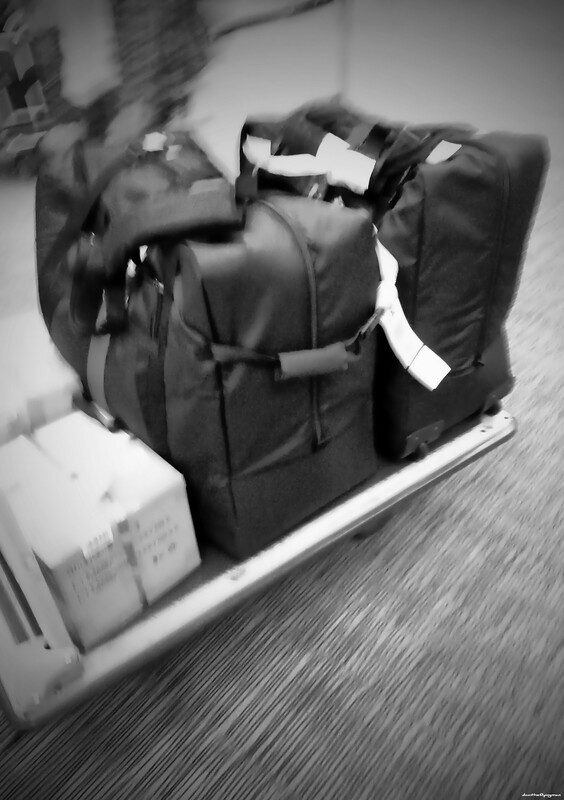 I had been there three years ago for a working trip. 7 June. 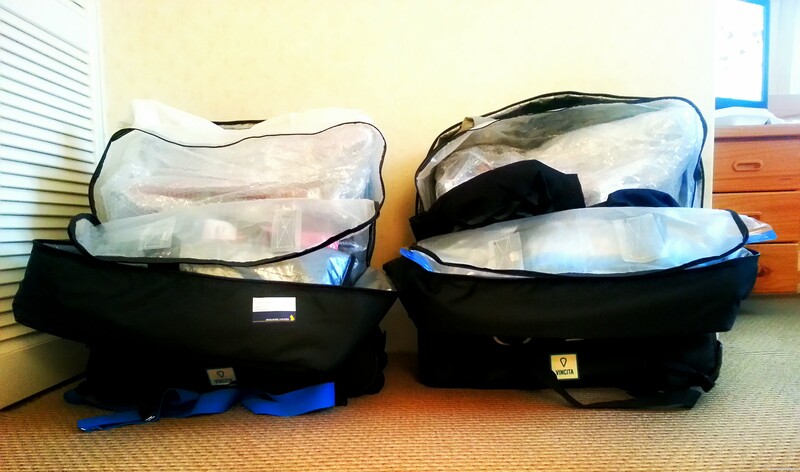 B transport bags with our clothings and other cycling equipment checked-in as fragile luggage. 8 June. We arrived at Perth at 5 in the morning. Too early for us to check-in. 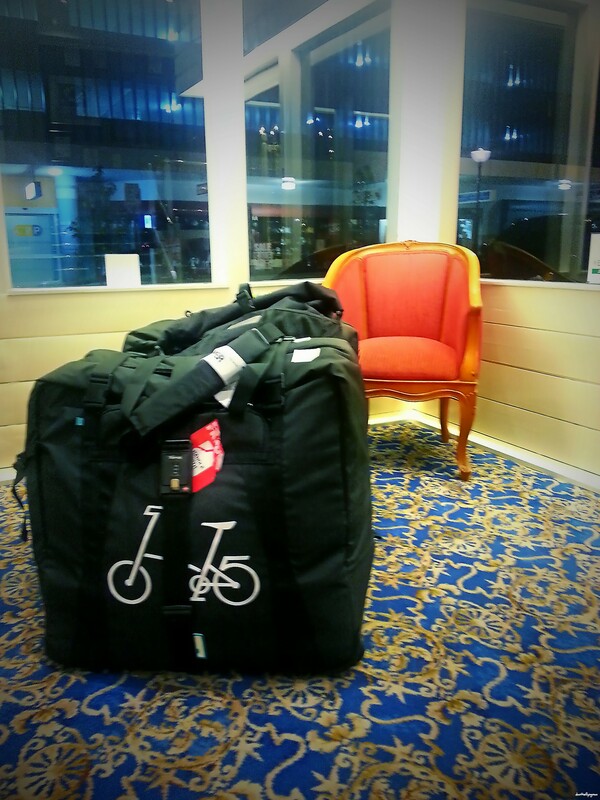 So we placed both transport bags into the luggage holding room and found a place to rest. Missus did not have a restful sleep during the flight. 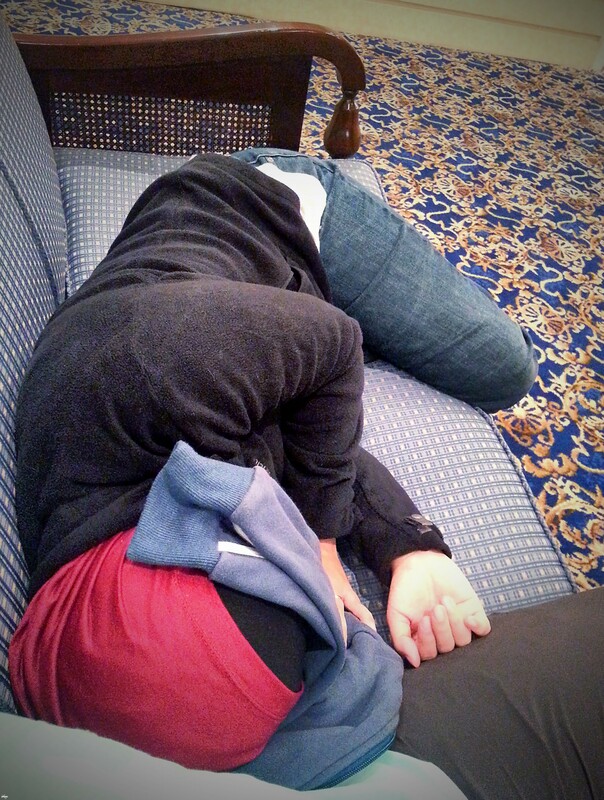 So she took 40 winks on a couch in the hotel. 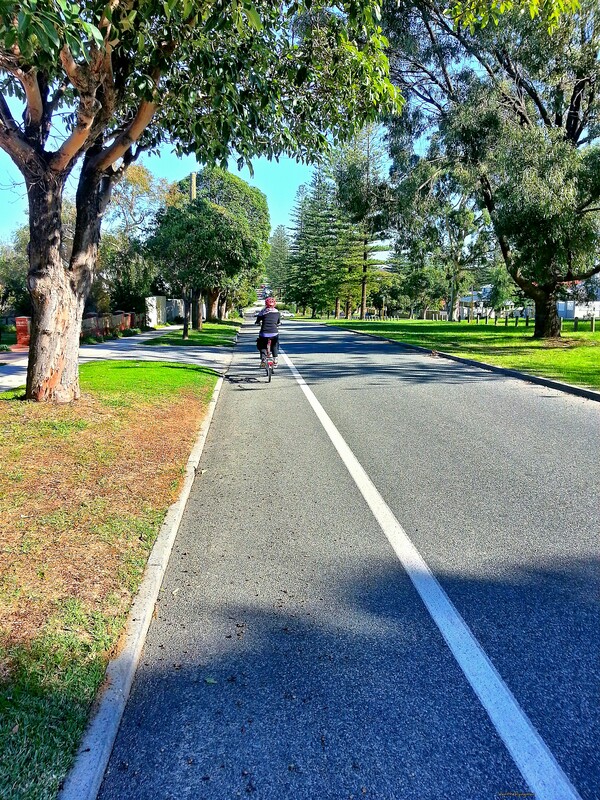 With the Missus having enough sleep, we headed out looking for breakfast on our walk towards Harbour Town. Along the way, we saw this dedicated path for both cyclists and pedestrians. After topping up of my work wear at the Kathmandu store at Harbour Town (my work wear mostly comes from Kathmandu and other outdoor adventure clothings store), we headed back to the hotel to check-in. A warm and cosy room awaited us and it was time for us to take a nice warm bath and rest for the day. 9 June. 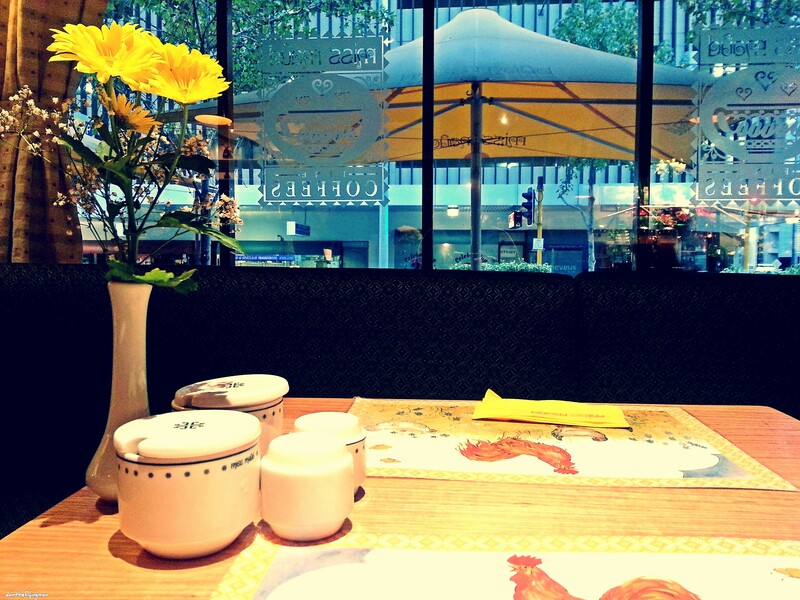 We had breakfast at the hotel’s restaurant. It was a cosy Swedish restaurant that serves a wonderful spread for breakfast. It was also a cold and wet morning, having rained during the early hours. The Bs ready for their day out. 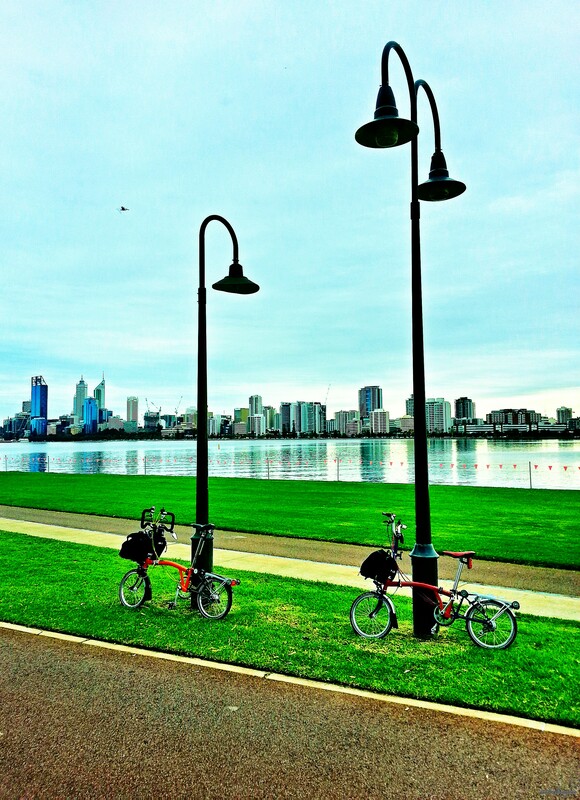 The starting point of our day’s ride, along the cycling path right beside the Swan River, with the Swan Bells Tower in the background. 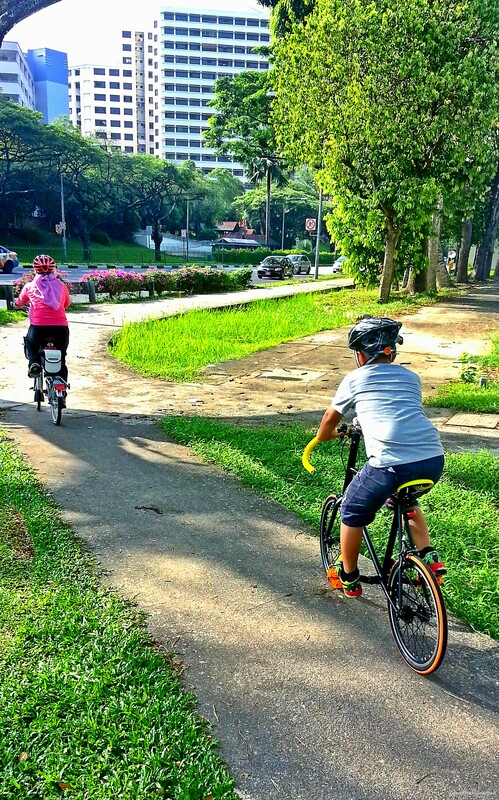 The cycling paths are well-designed and well-thought out. 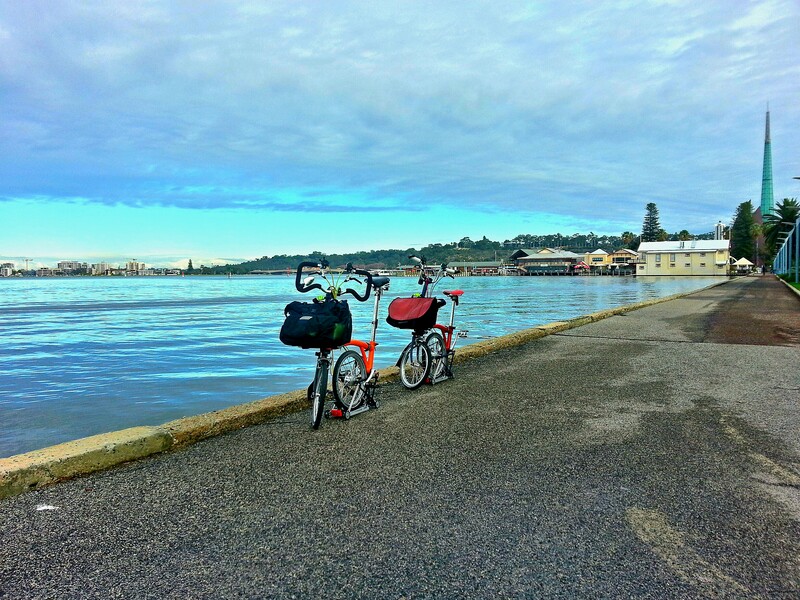 After visiting the local Brompton distributor and losing our way, we headed back to Victoria Park, a small town we passed while losing our way. 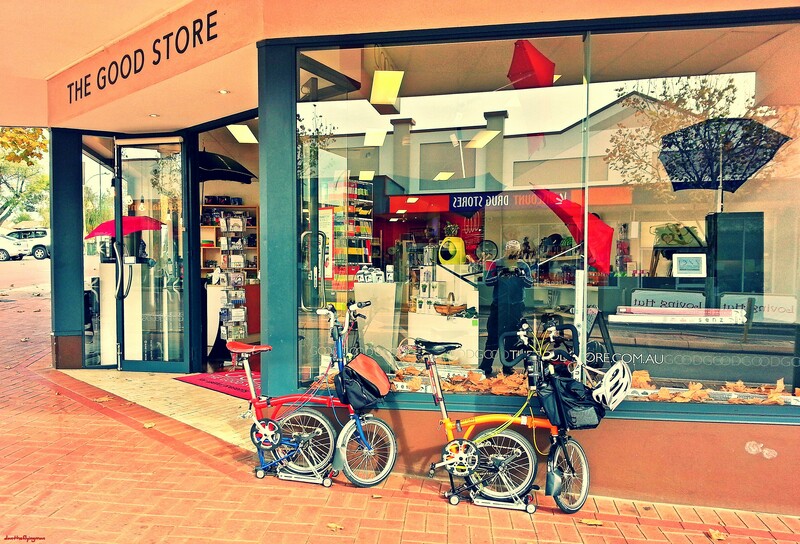 Visited this shop at Victoria Park as promised to the owner, who was very kind to give us very specific directions to head towards the local Brompton distributor earlier. Soon it was lunch and stopped for a quick vegan lunch at the outlet of the same eatery we ate our dinner when we were in Jeju last December. 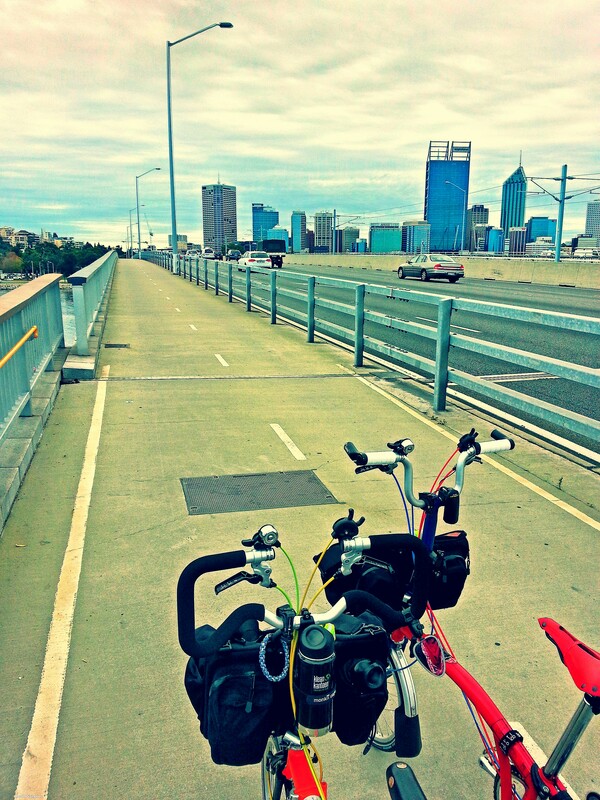 Took another route along the Swan River to return to Perth City Center. Panoramic view of Perth City Center with Swan Lake in the foreground. 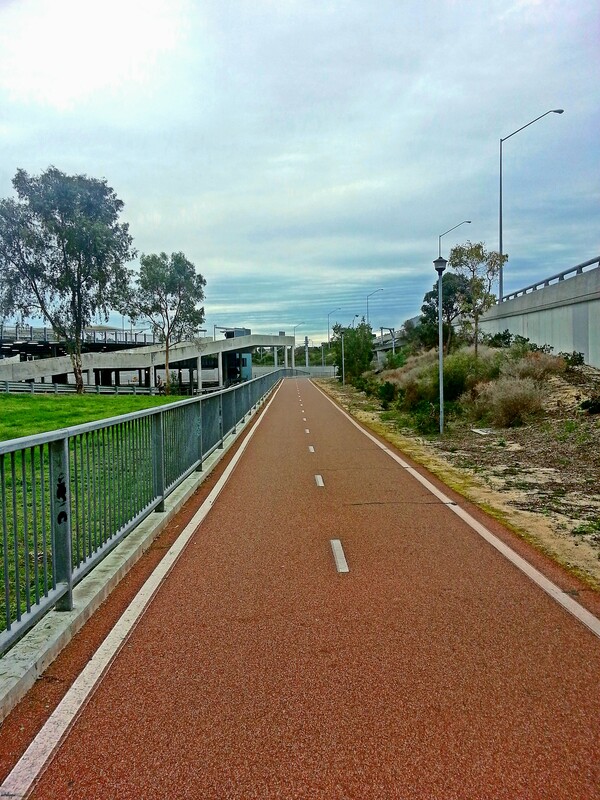 The cycling path built right next to the vehicle lanes on the expressway next to King’s Park. How cool is that? Before we called it a day, Missus took her B for some off-track cycling and posing. 10 June. 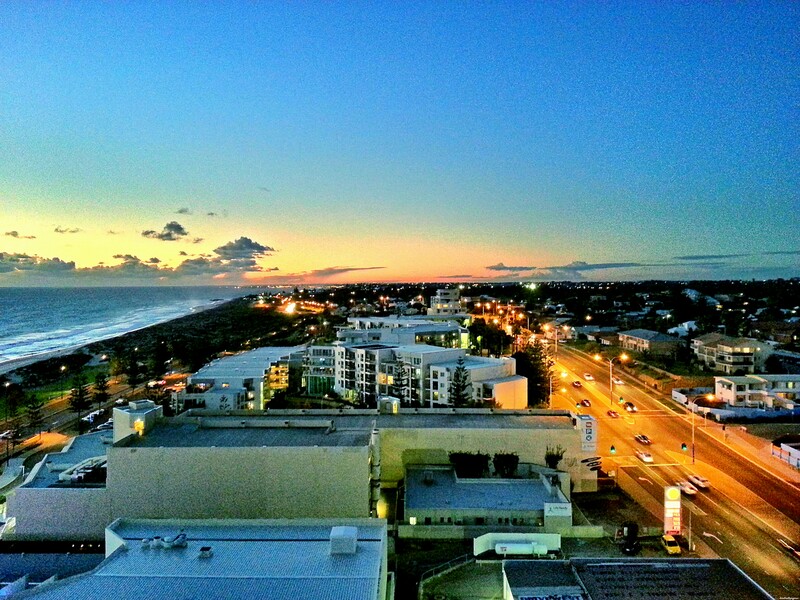 We moved off to our second accommodation in Scarborough after finding out that this hotel offers a gorgeous view of the Indian Ocean. 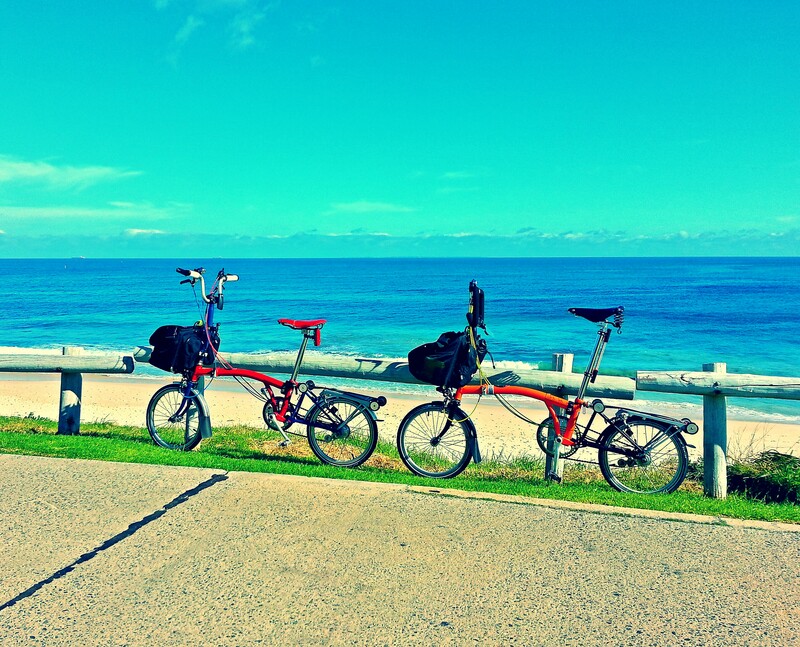 Another reason is because we had planned to cycle down Sunset Coast to Fremantle. We reached early and paid to check-in early, plus a room upgrade. Upon entering the room, this was the gorgeous view we had, with a thunderstorm approaching. 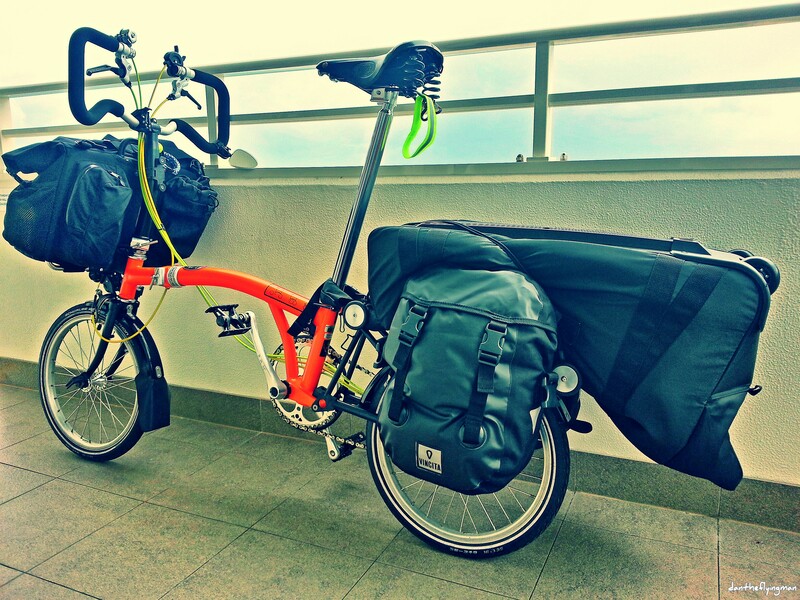 How I carried both our clothings and cycling equipment on my B, leaving Missus’ B to carry some light stuff and her B transport bag. Rested and did some work in the room, waiting for the thunderstorm to clear. 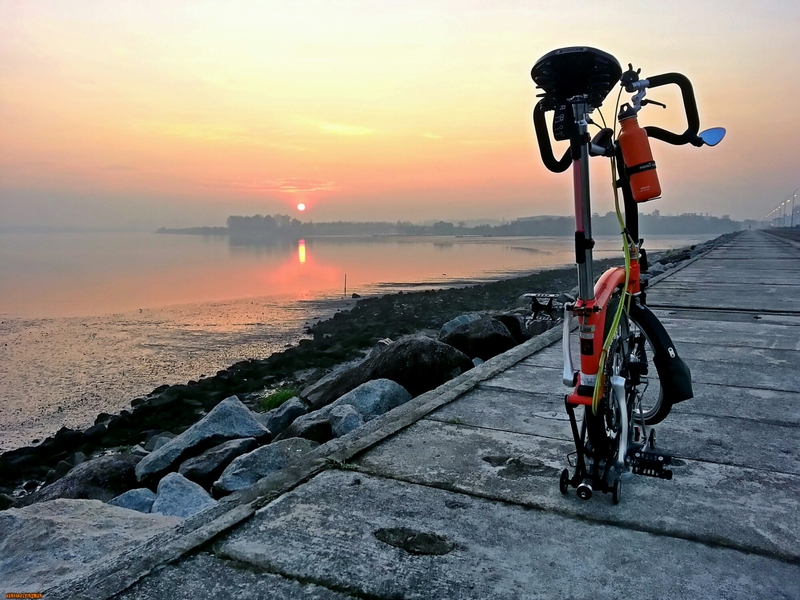 It cleared by evening and soon we were out for a short ride along Sunset Coast. 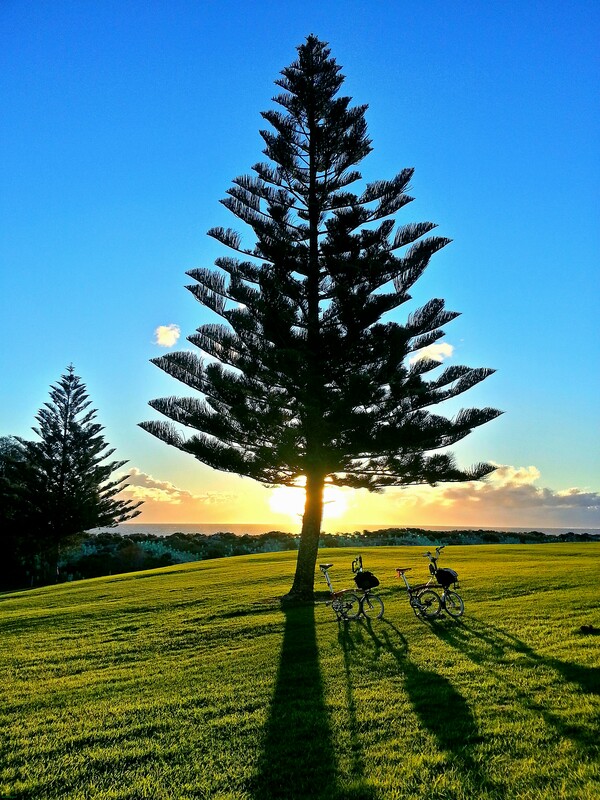 Along the way while the sun was setting, I saw this gorgeous scene and knew instantly that our Bs have to be there with the tree and the sun in the background. A gorgeous setting for anyone who would want to have their pre-wedding shoot or photoshoot in Perth. Another shot with the tree, Bs and sun only. Returned to the room in time to capture this part of the city during blue hour, a few minutes of the day just before the sun sets totally. 11 June. 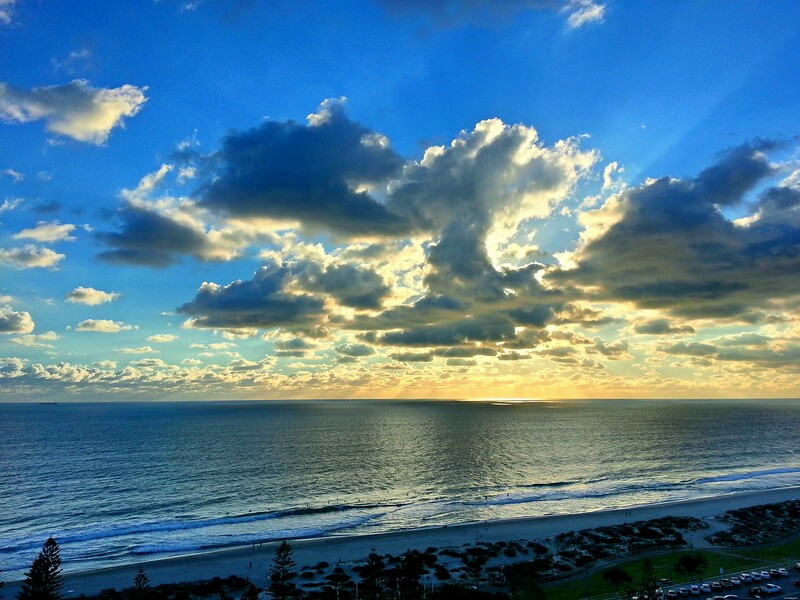 The sun rising over the horizon on our 4th day in Perth. 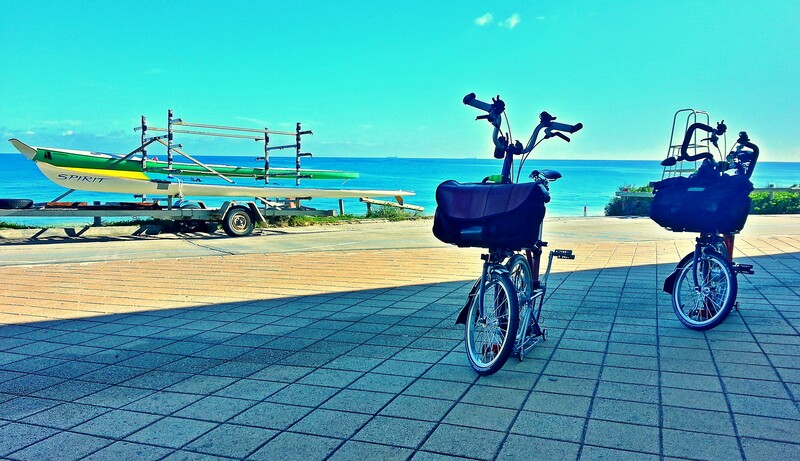 A beautiful to cycle to Fremantle. 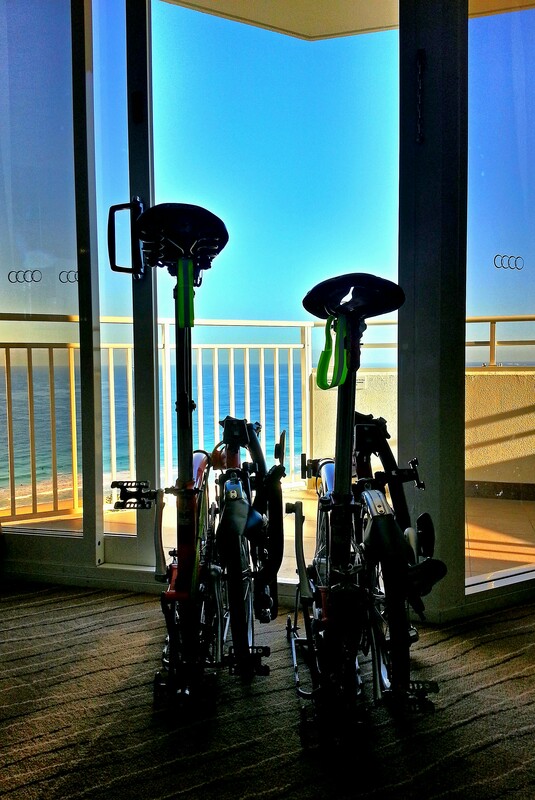 The Bs cannot wait to hit the paths to Fremantle. 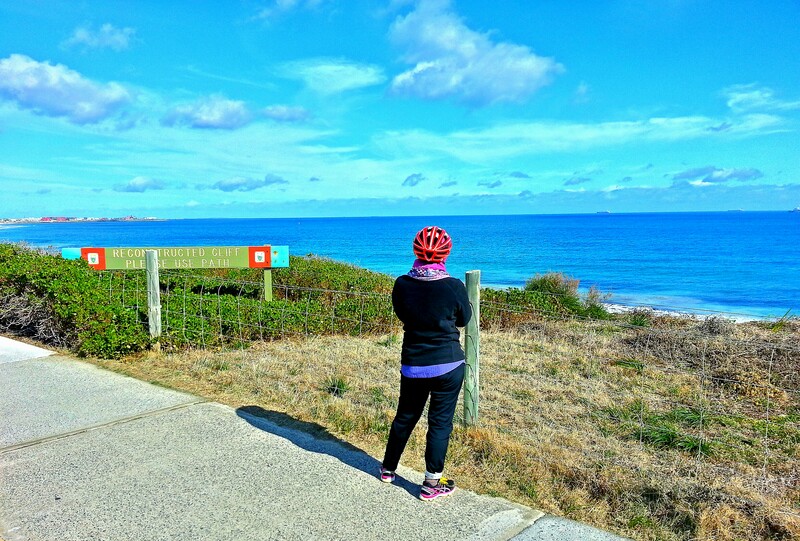 After cycling for more than 13km along the cycling path next to the road, we turned right at one of the metro stations and cycled up this hilly road, which will rejoin Sunset Coast on the way to Fremantle. Missus giving her all, despite the discomfort and slight pain at the coccyx. The first sign that we have rejoined Sunset Coast. 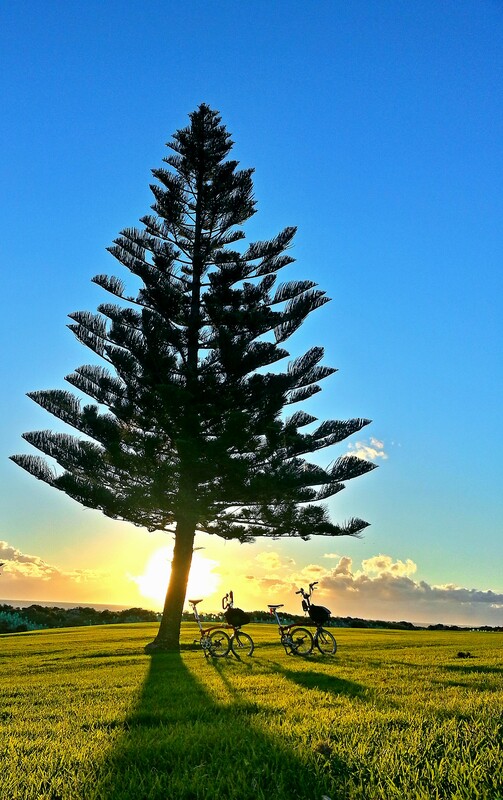 With the Indian Ocean in the background, Sunset Coast is a scenic stretch of cycling path leading towards Fremantle. 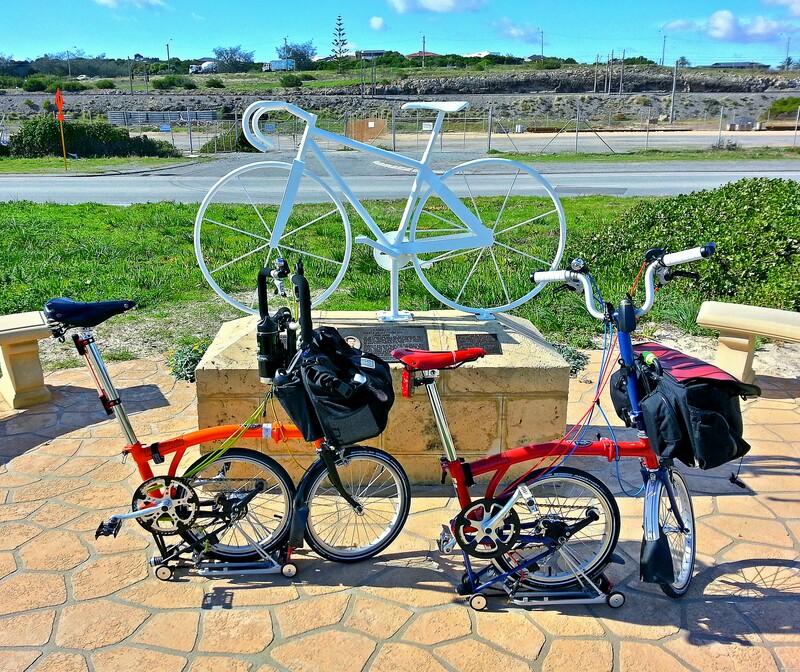 Along the way, we saw this ghost bike, a memorial to a cyclist who passed away while cycling on the road. 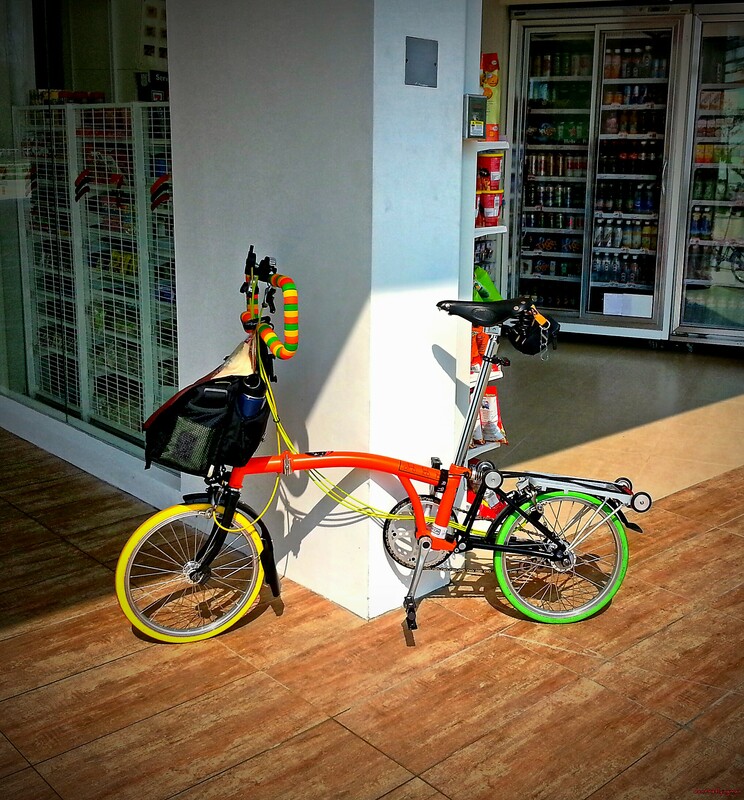 This ghost bike was set up by the family of Timothy David Anderson (7 April 1985 – 9 March 2012) who died tragically at the age of 26 after being hit from behind by a drunk driver. while cycling in the bicycle lane in a safe and responsible manner and had his helmet, high visibility clothing and lights on. 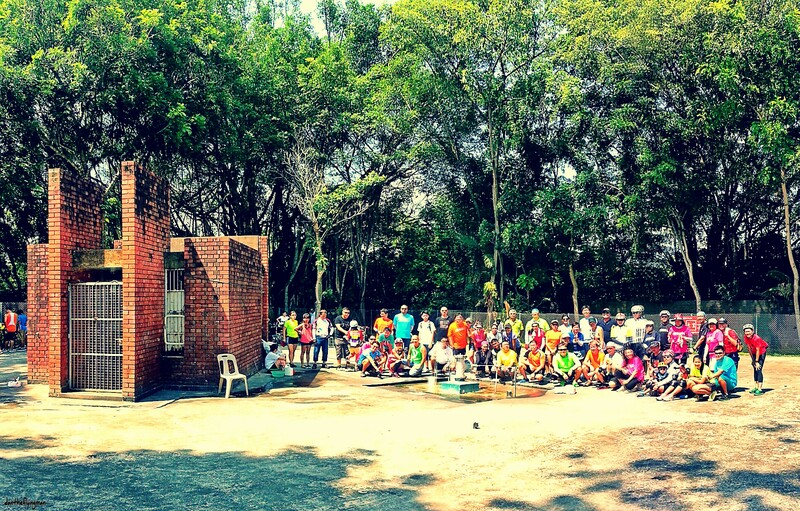 This memorial serves as a reminder to all to drive responsibly and cycling safely. 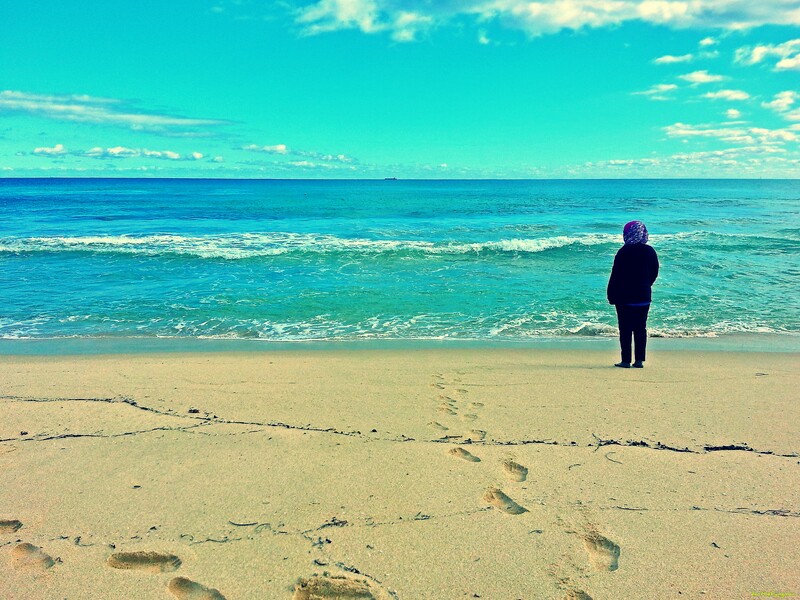 Missus soaking in the sight, sound, and aroma of the Indian Ocean. 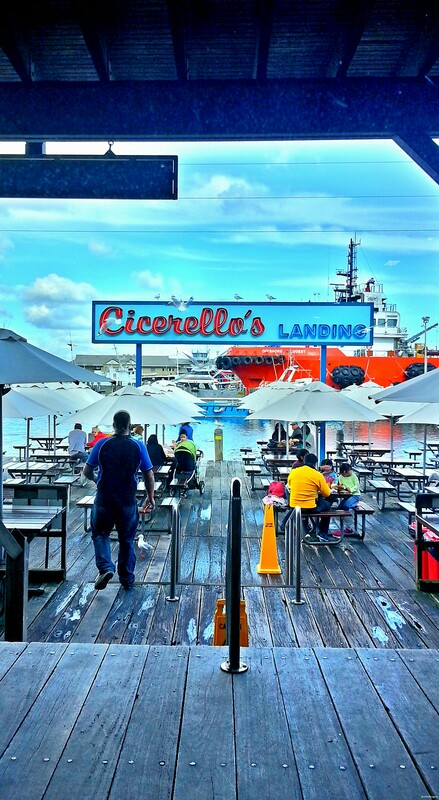 After about three and half hours of cycling leisurely, we reached our end point, Missus’ reward, me revisiting this place that serves wonderful fresh seafood and our lunch. 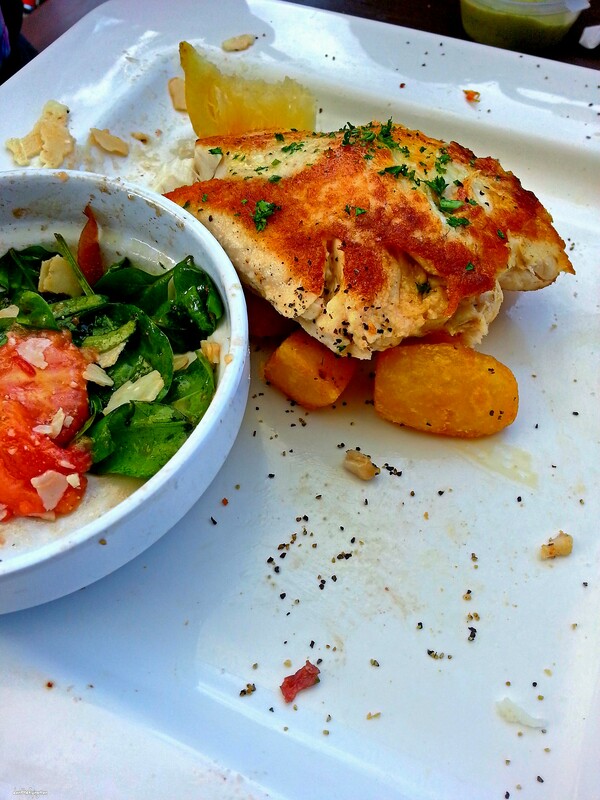 Missus soon gobbled up her lunch of grilled red snapper with seasonal vegetables and grilled potatoes hungrily. 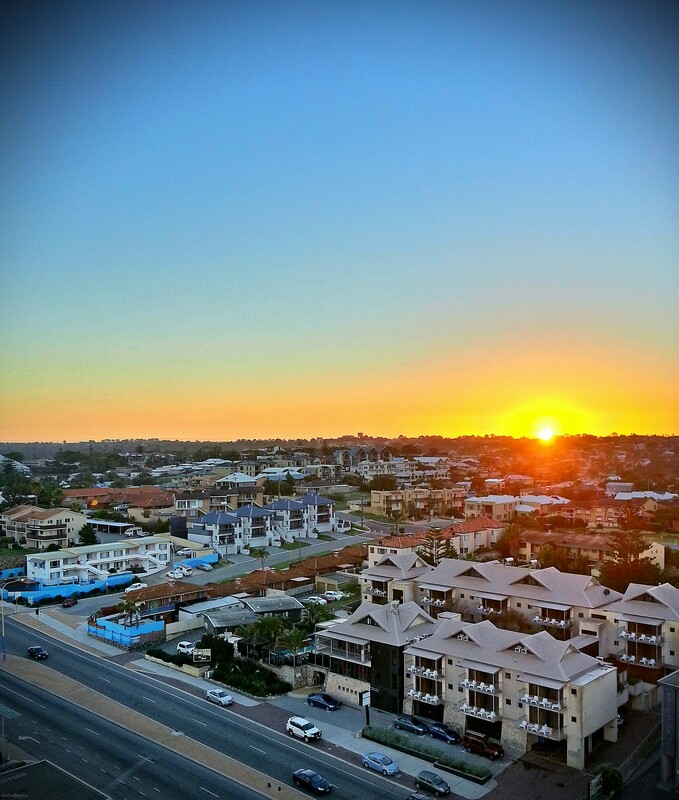 After cycling around Fremantle, we headed back to the hotel, in time to capture this beautiful scenery. A preview of the time lapse video which will be taken the following evening. 12 June. 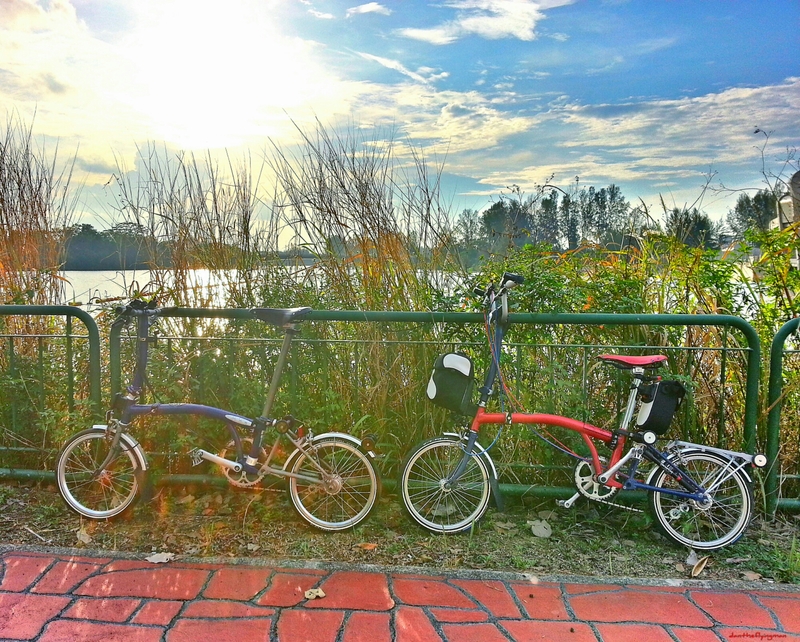 We took a day off cycling for Missus to recuperate and us to slow things down even further for this trip. We walked around the area near the hotel. 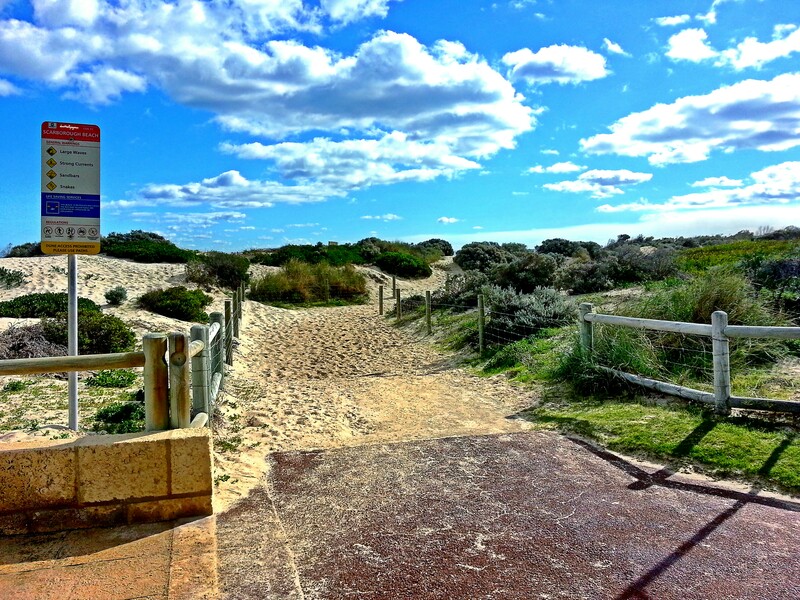 There were numerous such entrances to the beach and they all came with a warning that there are snakes around. Missus getting closer to the majestic Indian Ocean. 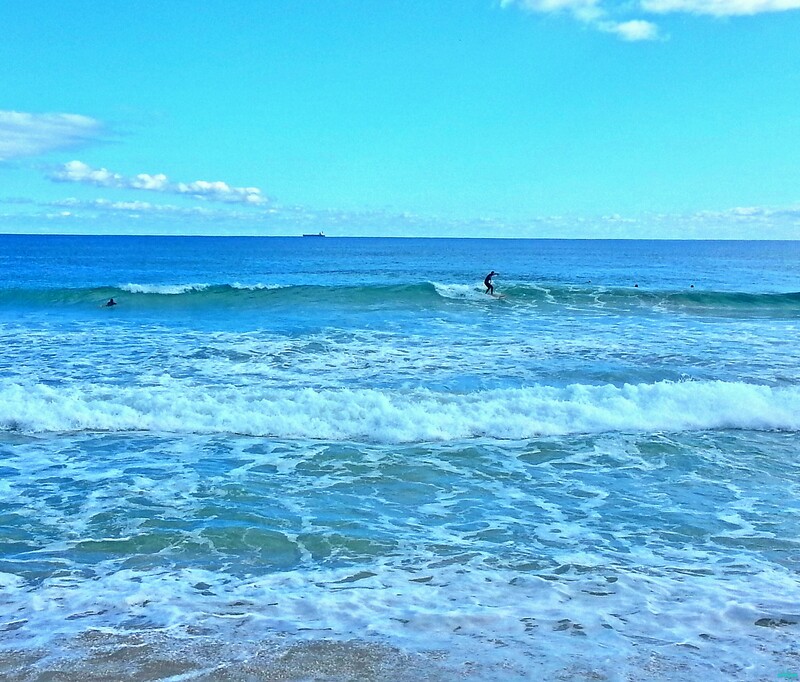 Some surfers attempting to ride the waves in the cold waters of winter. 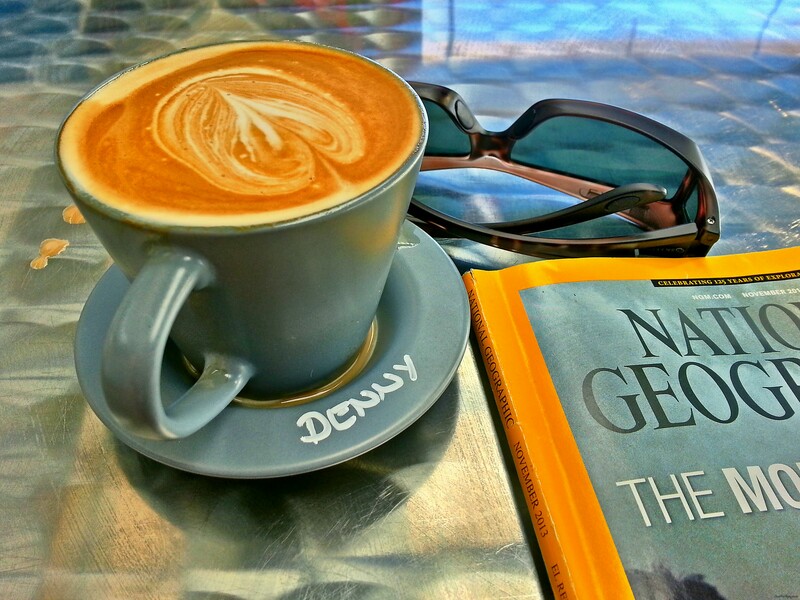 Found a nice cafe by the beach and ordered a cuppa to go with some readings we were doing. 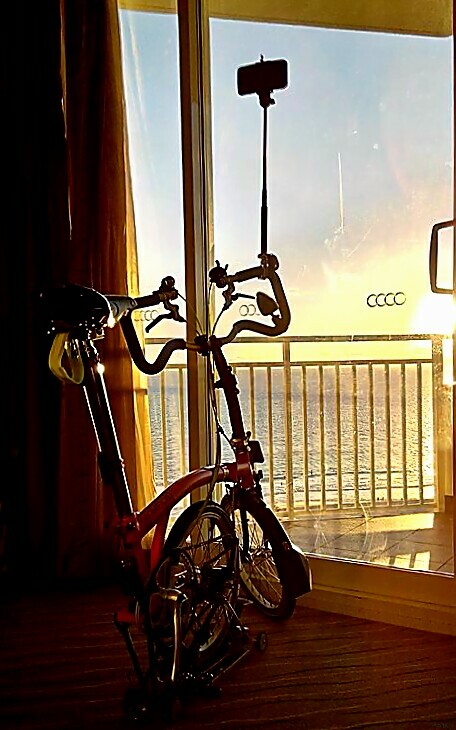 Returned to the hotel room to setup for a time lapse video of the sun setting, using the B as a rig and a monopod to mount the mobile phone. 13 June. We checked out in the morning to catch our flight back home, leaving behind wonderful memories of gorgeous views and delicious food. 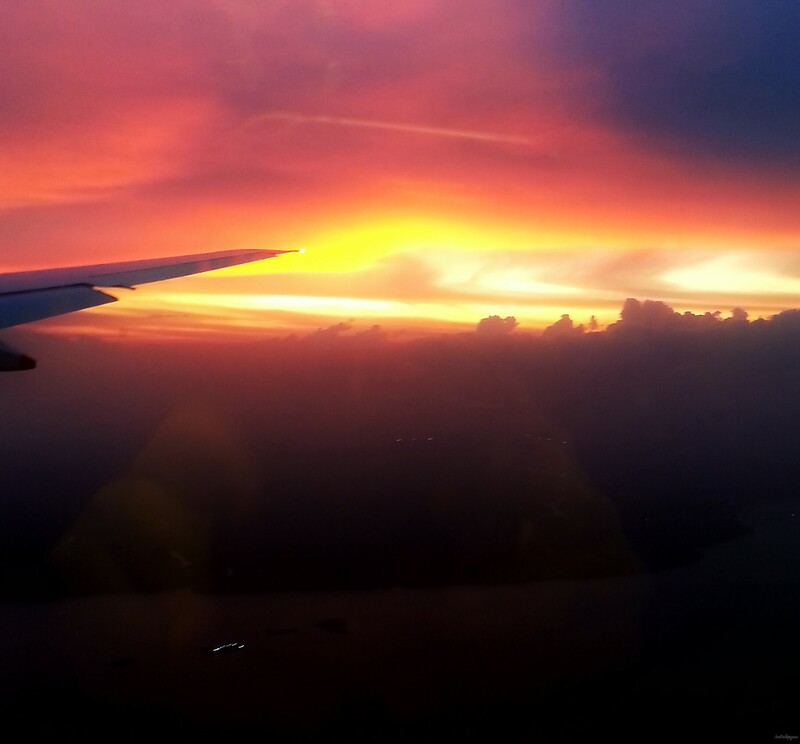 The fiery sky which greeted us on our approach towards home airport. 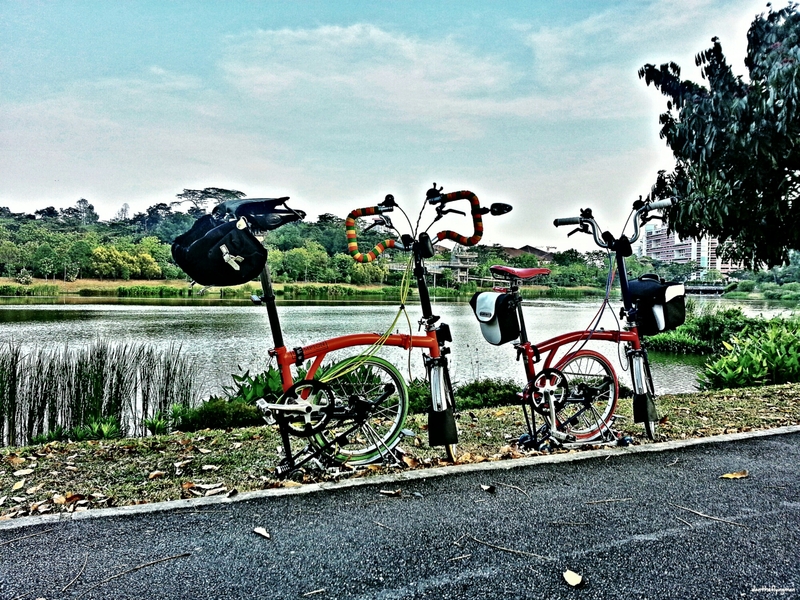 Till the next time we cycle. It has been a while since I posted. The month of April and May was hectic with work back to back. 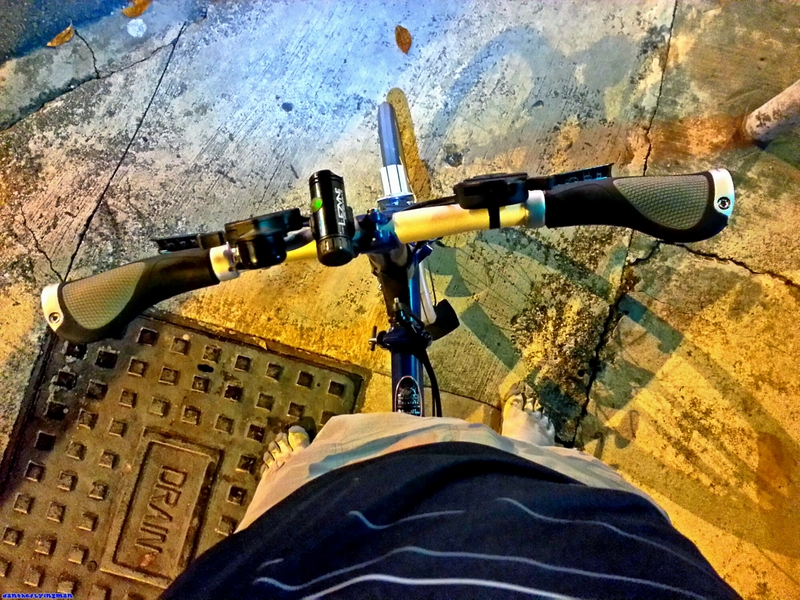 Nonetheless, I still managed to squeeze some time out for riding. 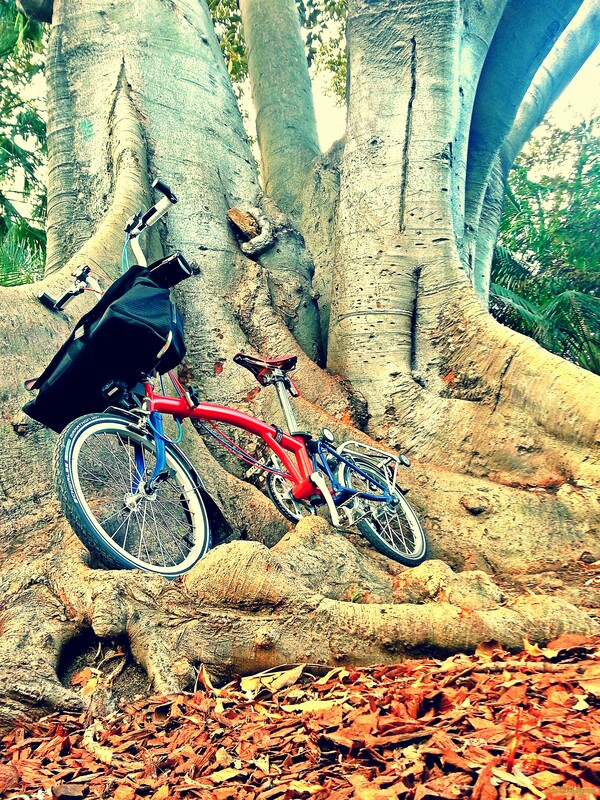 Brought the nephew out for his first long distance ride on his fixie. 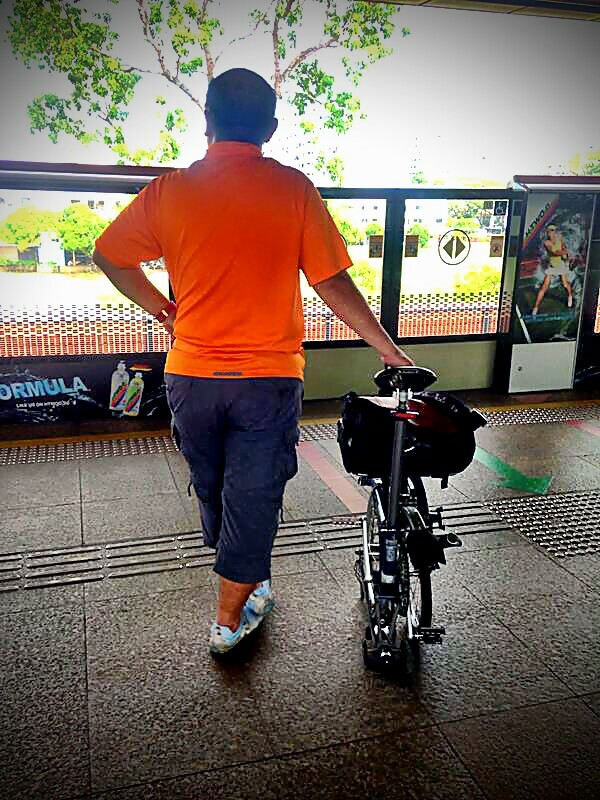 Must saw he is doing great, averaging 12km/h for a total distance of slightly more than 11km. My last ride on Tannus tyres. Had planned to attempt a half island ride but abandoned the idea at the quarter mark due to the weather and these tyres. The first time I took the B along with me on the metro. Managed to catch the sunrise on another ride to a neighbouring town with the Missus, after both of us swapping out the Tannus for Marathons. Missus’ Dr Seuss against a field of lallangs. 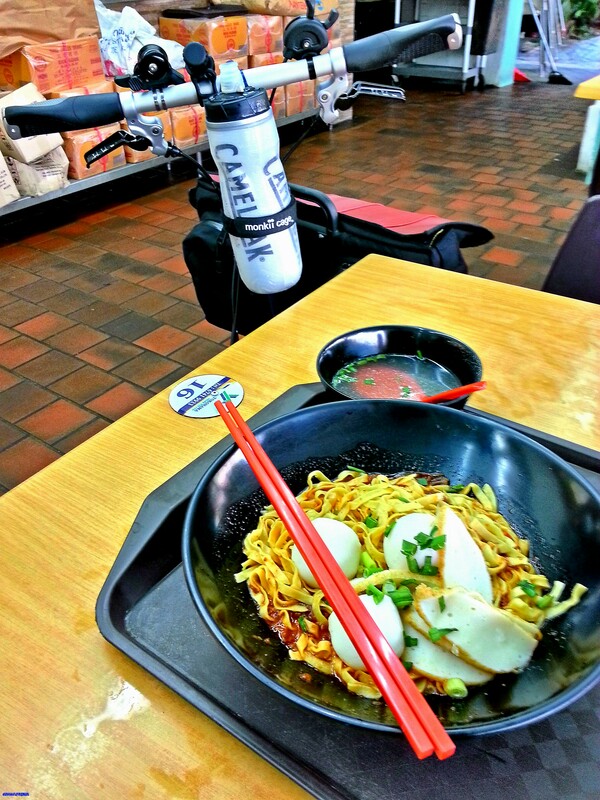 Missus’ reward for her first long distance ride after a long time. 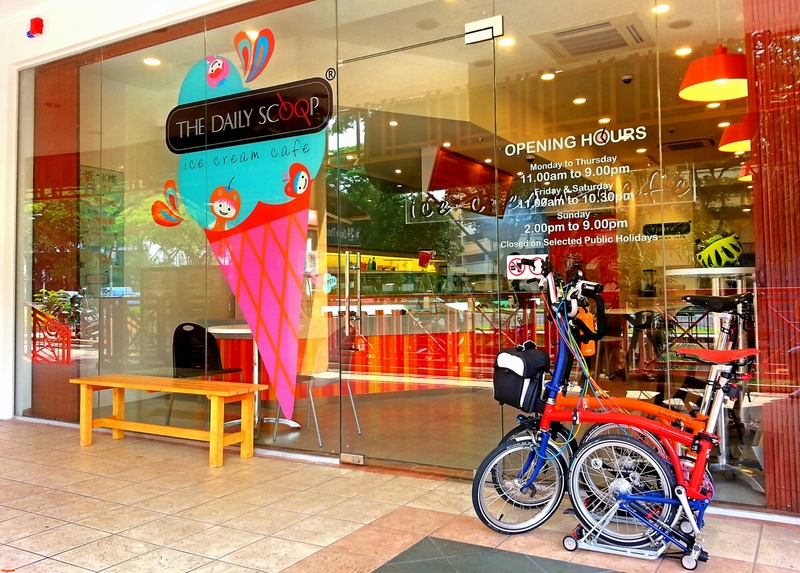 The local Brompton group, Brompton Riders @ Sg, celebrating its second annual Brompton Day where Brompton owners came together to ride together and network. 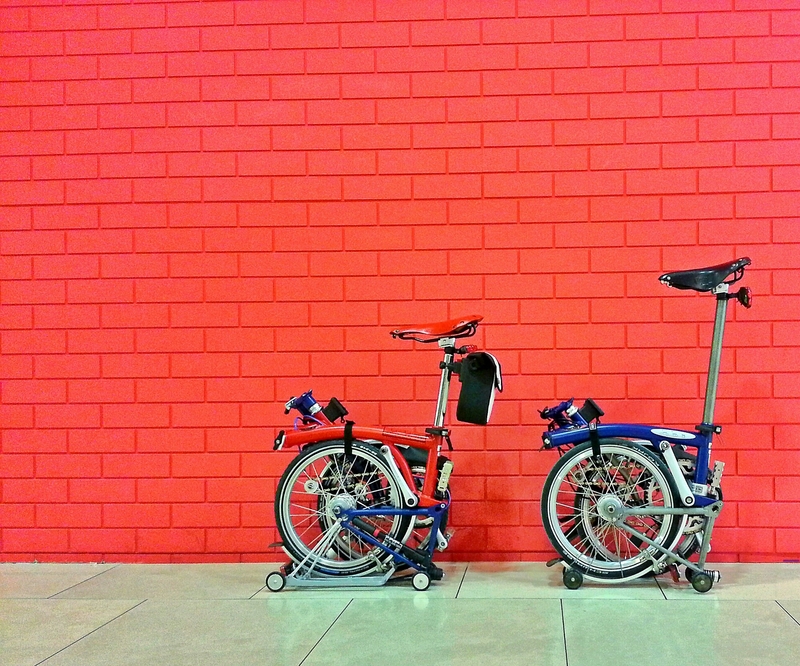 We had close to 190 Bromptons turning up on that day. 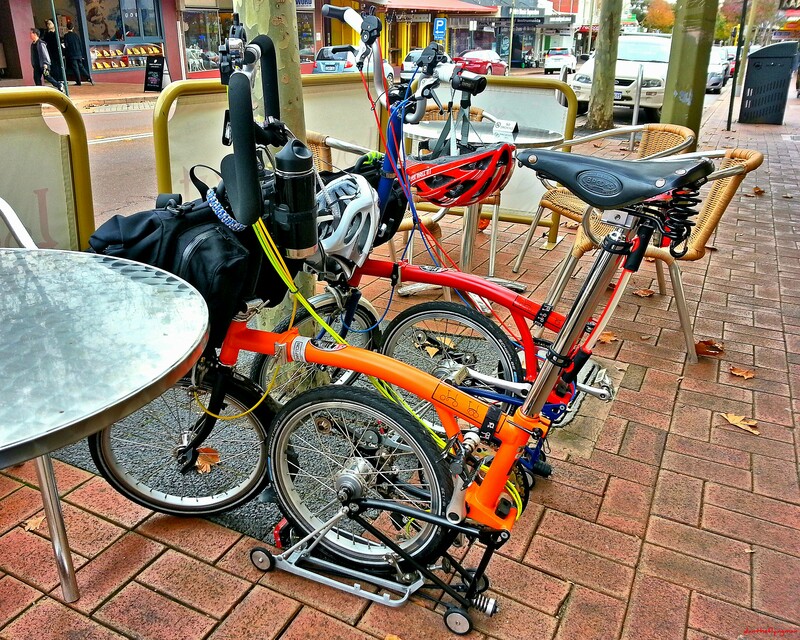 Met up with a few riding buddies for a ride for coffee and food. At the same time, conducted a post-mortem and forward planning for the following year’s anniversary and some upcoming events for the year. 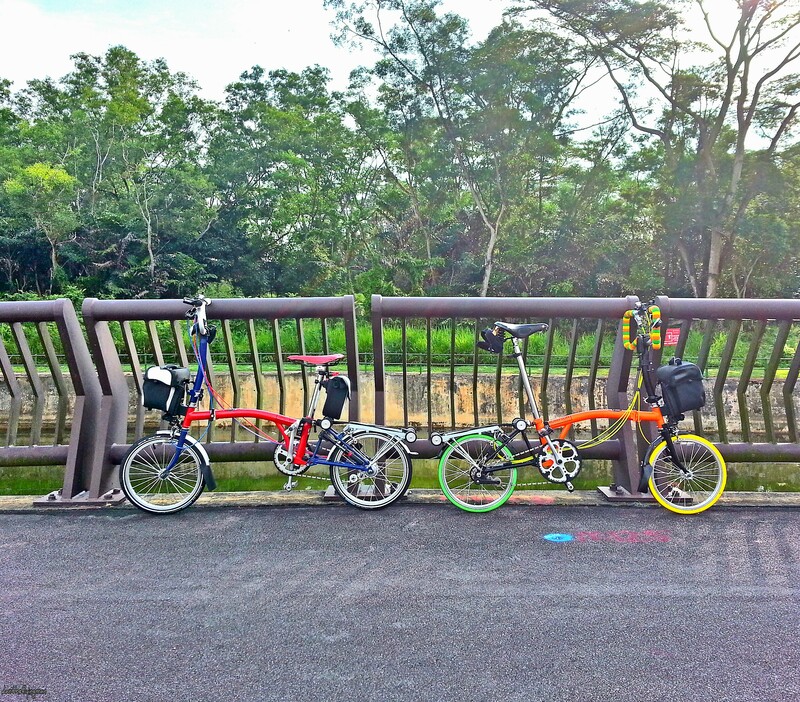 Reconed a route for a ride the riding buddies and I were hosting. 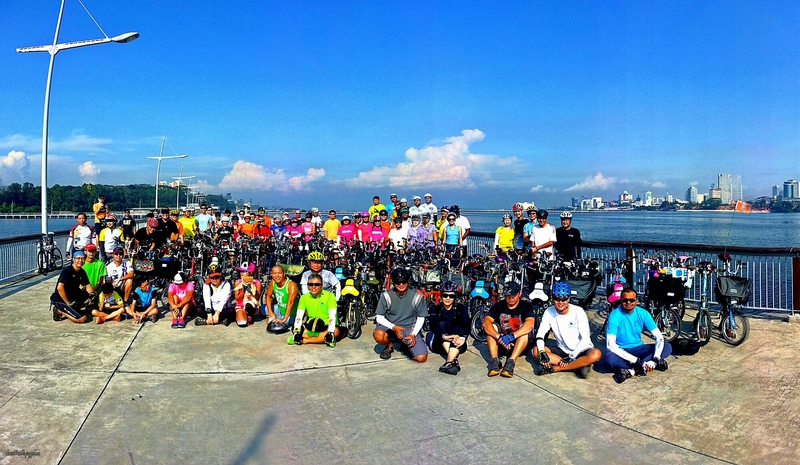 The ride hosted by the riding buddies and I to a waterfront jetty. After the waterfront jetty, we headed to the last hot springs in the country. Managed to get hold of two pieces of these extremely hard 3rd-party suspension block. Ti B is now a hardtail. Cleaned the Ti B after a month of acquiring it from the previous owner. This B would have rode more than 10 times by both owners. 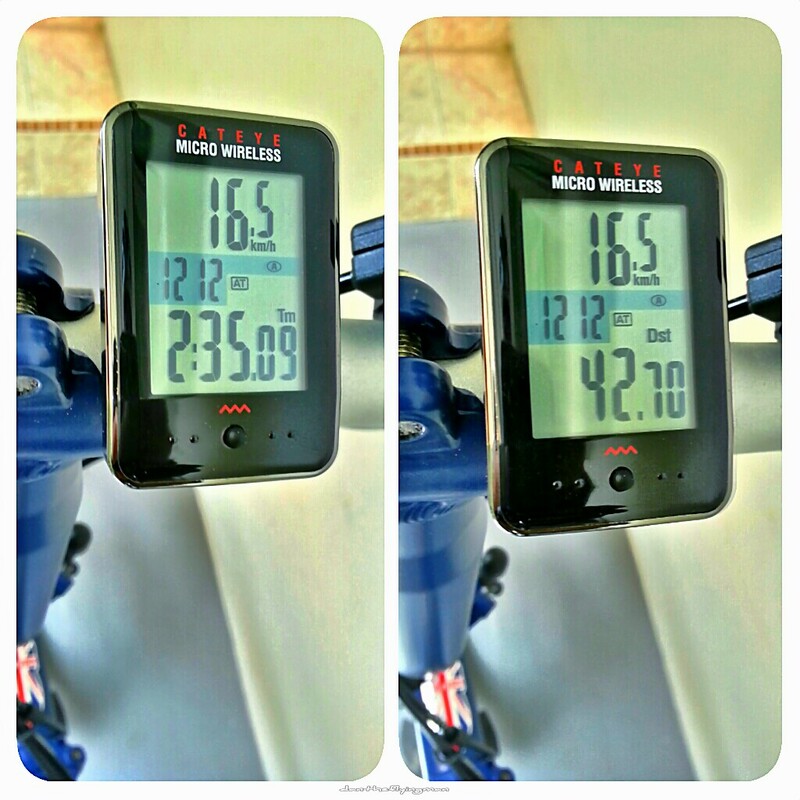 The total distance and time taken for a recent ride with the riding buddies. Maximum speed reached for this ride was 30.6lm/h. After the recent ride with the riding buddies, and only less than 24 hours since it was cleaned. All muddy and wet. 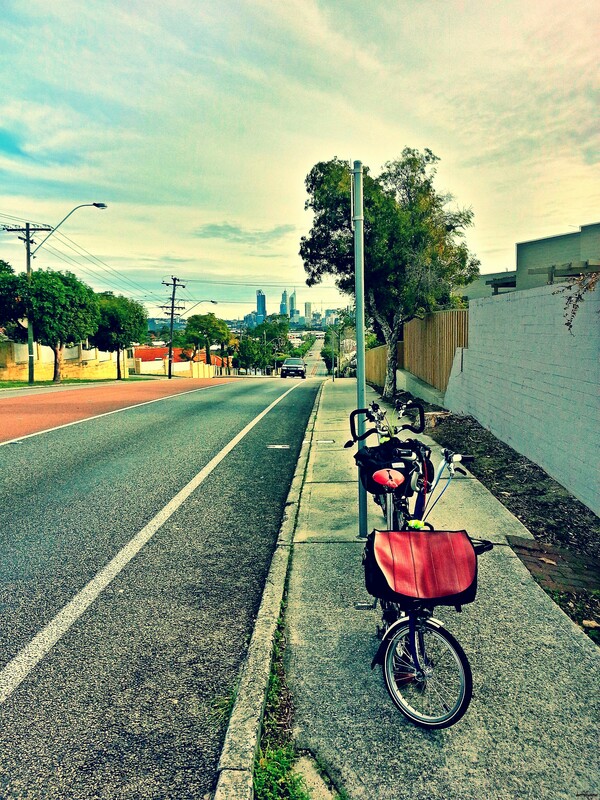 Friday was one of those days where I cycled to work. Having meetings starting late means I can have breakfast leisurely before making my way out. Usual fare at a nearby eatery. 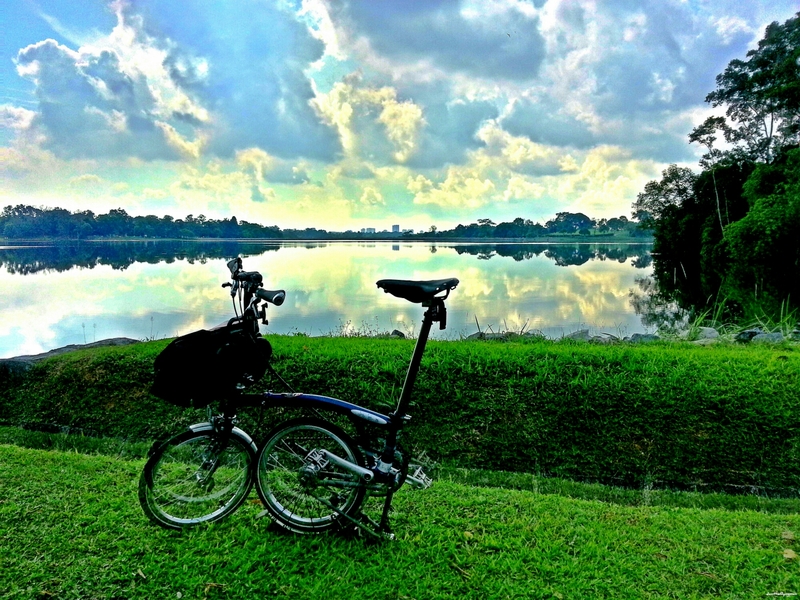 A ride over the weekend to s neighbouring town. Missus was able to do so without experiencing any sharp pains. 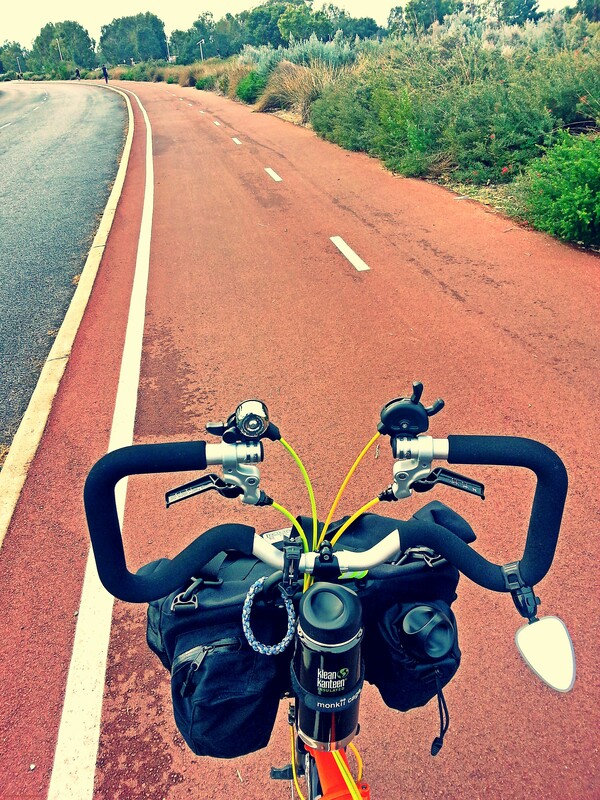 A milestone and confirmation that the swap to Schwalbe Marathons was the right move. Came home from work early on Thursday and since Missus was not cooking, we rode out for our dinner at a Japanese restaurant a town away. The staff there allowed us to park our Bs inside the restaurant. 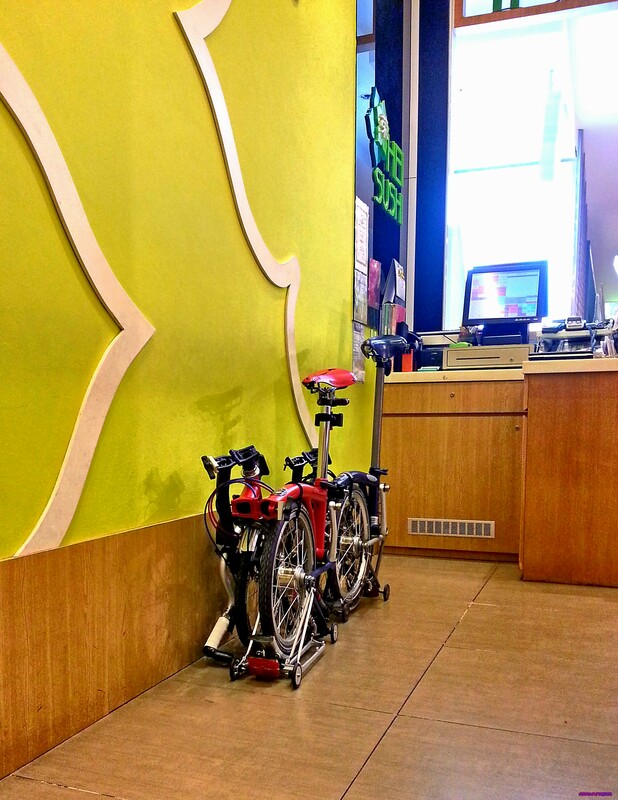 Am seeing more restaurants and eateries allowing folded bikes into their premises. Bs posing while awaiting for Missus at a clothing store. 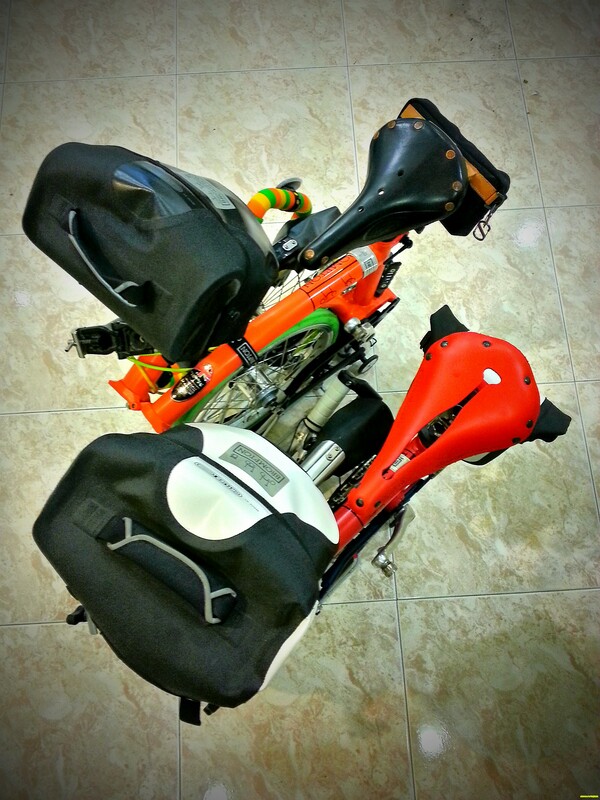 Purchased a set of cloth panniers for a great discount in preparation for the possibility of an overseas tour cycling. 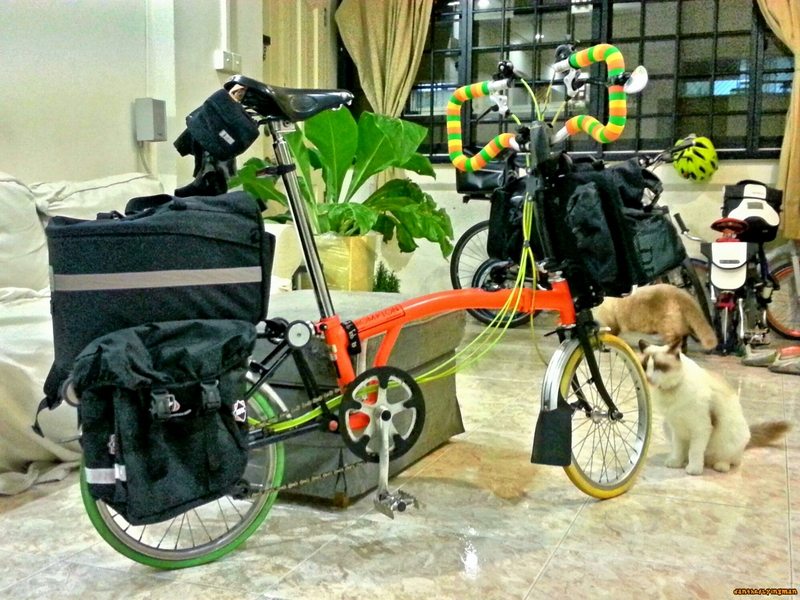 How it looks together with rhe T-Bag on front, the Rack Sack on the rack and panniers at the side. 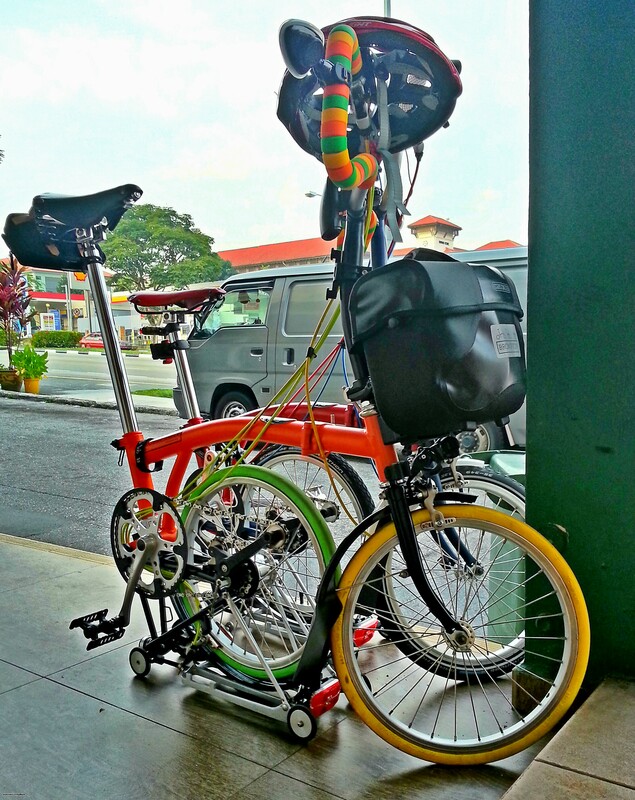 Still considering if I should get the Ortlieb Front Rollers Classic, although they will hang even lower. 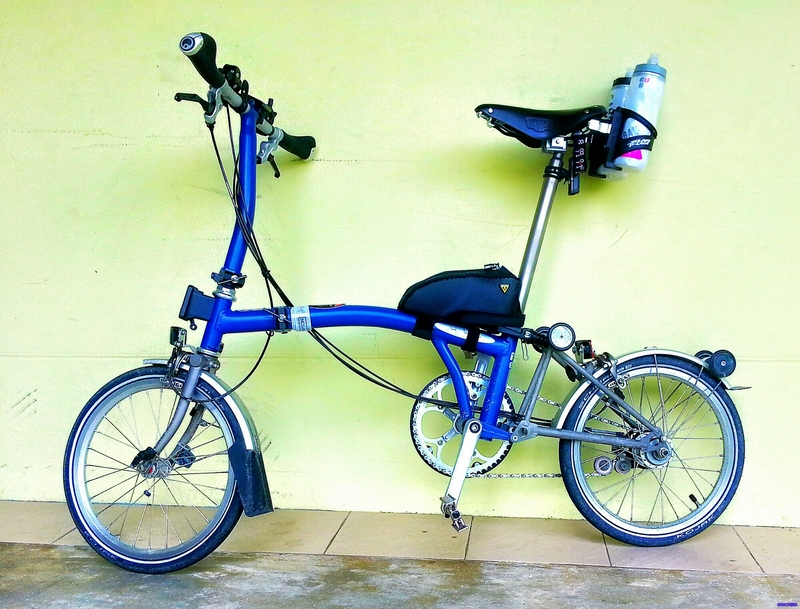 Have always planned to get a Titanium Brompton or something that is sub-10kg in weight (Tyrell, Alex Mouton, etc) for speedier rides. 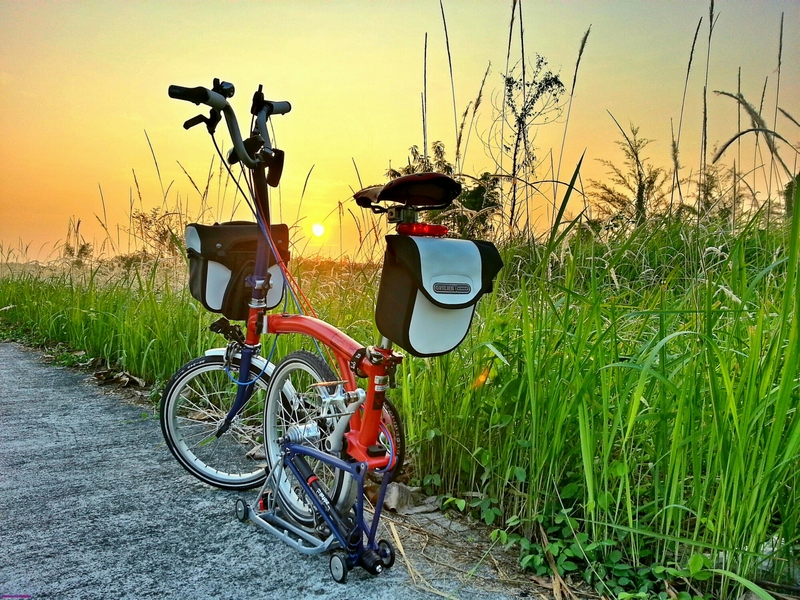 So when someone was selling a 5-rides, less than a year old Titanium Brompton, and with a waiting period of 3 months for a brand new, I grabbed it after viewing. Swapped out some stuff that came with it on my own and had more weight reduction parts installed at the distributor. Took it out the night before to get some dinner. It is a gorgeous piece of equipment. 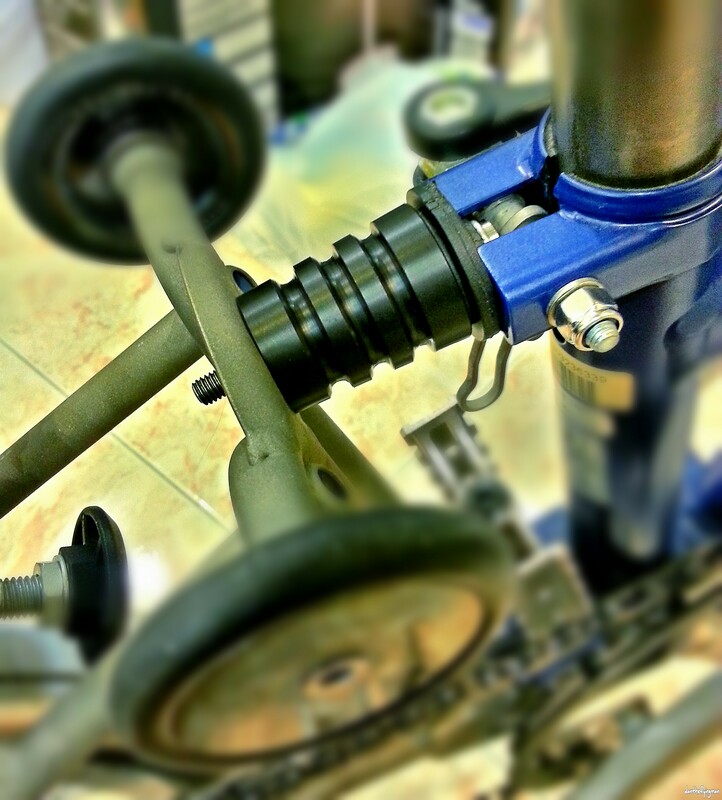 I was flying on 54T crank and Kojak tyres at less than 10kg. Possible Drastic Reduction of Back Pain? Missus has been experiencing very bad back pains in recent months while riding. Thinking that it could be the saddles, it was changed from B17 to B67. She loved the B67, but it still gave her the pains. 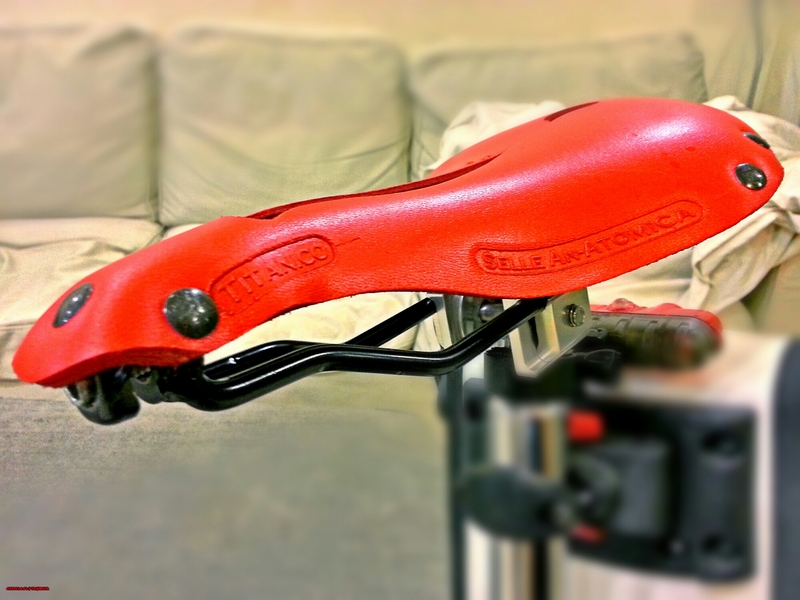 When a pal advertised that his Selle Anatomica saddle for sale, and having heard so much about comfort on this saddle, I grabbed it and installed it on the Missus’ B. In matching colours to Missus’ B. Brought it out for a very short ride to assess how the saddle fairs for her. Too short a distance to tell. With me having returned from Shanghai from a working trip 2 weeks ago, I dropped off our Bs at the distributor for a long overdue full servicing plus some upgrades for the Missus’ B. 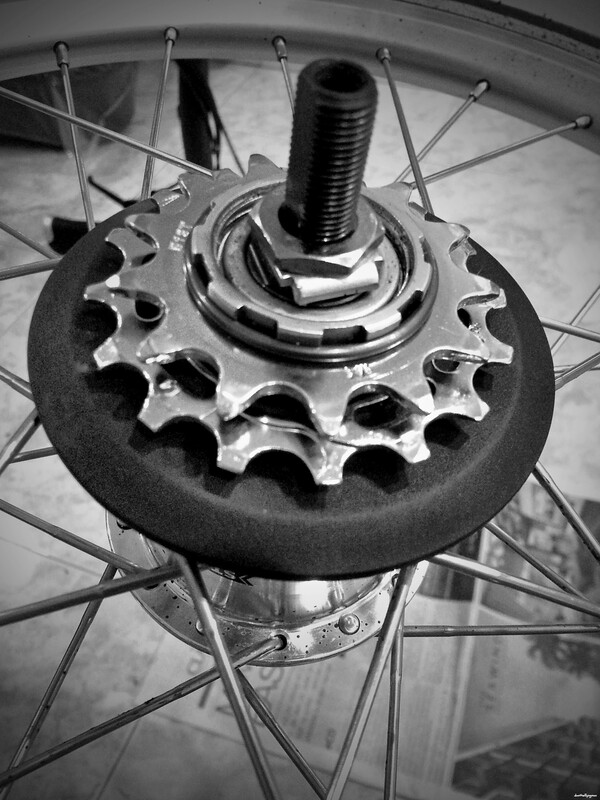 One of these upgrades was to swap out the Tannus tyres on hers to Schwalbe Marathon tyres. We concluded that it could be the tyres being too hard and not offering much absorption for her. 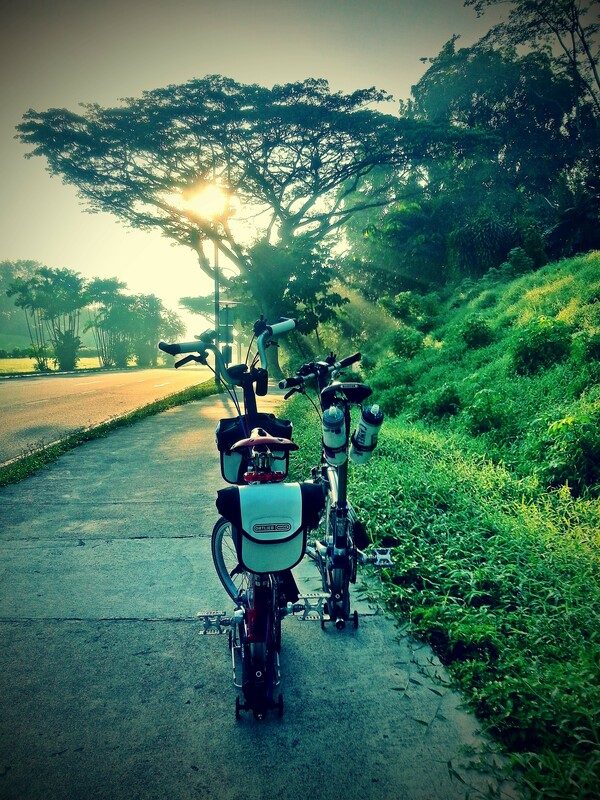 Out and about that very weekend for a ride, after having breakfast. Considering that we rode close to 20km and Missus not feeling much sharp pains, except for occassional aches, I am happy to say that the swap of tyres have helped greatly. One last thing for this post. The times when she was on Tannus tyres have trained her stamina and fitness greatly. So much so that she was zooming off on the new tyres.